Hi there! 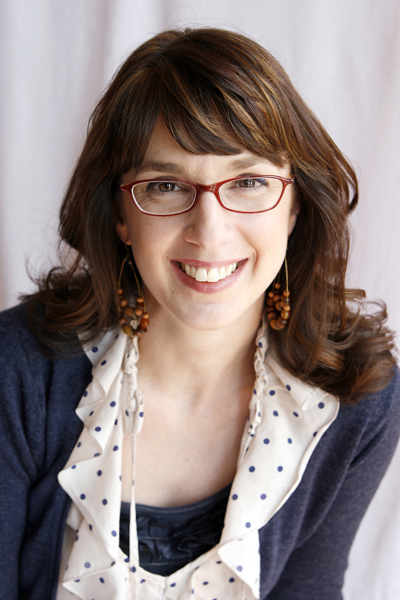 I’m Cindy Tobey, an avid scrapbooker and contributing writer for Creating Keepsakes magazine. I’m so excited to be here today as a guest! When I create a scrapbook page, I always try to include elements that support and strengthen my page theme. Some of these elements are quite obvious and some are not so obvious. Let me explain what I mean with the layout below. First Glasses by Cindy Tobey. Supplies: Patterned paper: Fancy Pants Designs and Jillibean Soup; Transparency: Prima; Stickers: BasicGrey; Decorative tape: Kamoi; Chipboard, rub-on, and tag: Fancy Pants Designs; Adhesive and pen: American Crafts; Other: bias tape, brads, buttons, and pocket page protector. For this page all about my son’s first pair of glasses I included two eyeglass page accents as well as an eye chart – all quite obviously support my page theme. To further play off from the eyeglasses theme I also included elements that are transparent, that you can see through, just like you can see through a pair of glasses – these transparent items all support my page theme, but not quite so obviously. Here are some tips on how you can use transparent products as I did on my layout. To begin, I decided to add a strip of transparent pockets along the edge of my page. Clear pockets are great for holding embellishments, photos, journaling tags – you name it! You could just layer the pockets over your background paper, but I chose to add them as an extension to my background to really show off their transparent quality. 1. Use a trading card pocket transparency. These can be found at an office supply store. 2. Cut out one vertical strip of pockets. Make your cut about 3/4″ away from the right edge of the row of pockets. You will use this excess to attach the strip of pockets to your background paper. 3. You can see that the pocket strip is shorter than a 12”x12” sheet of paper. Trim your patterned paper to the same height as the pockets. My page ended up being 12” wide by 11” high. 4. 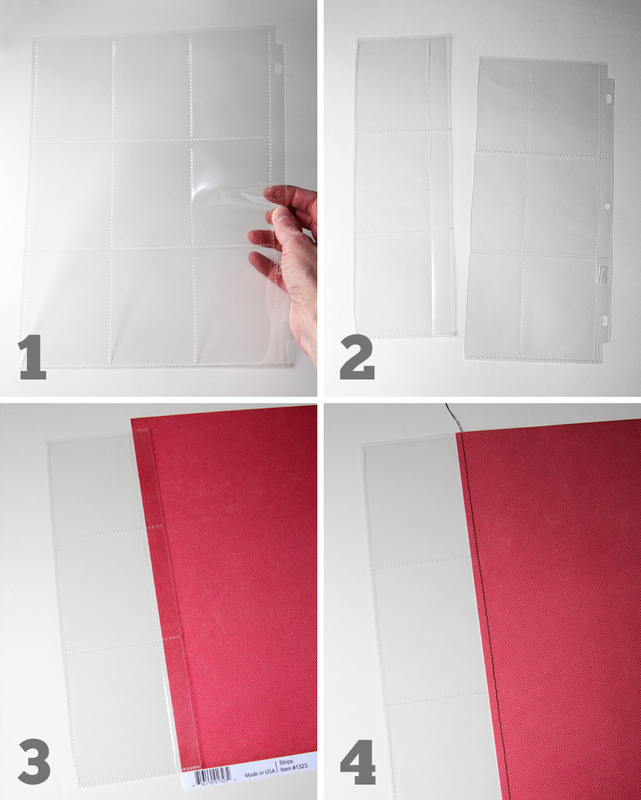 Attach the pockets to the back of your paper with adhesive. I also added a line of machine stitching to further secure them to my page. Finally, measure the width of your page with pockets attached and trim excess patterned paper away to make your page 12” wide including the clear pockets. To keep a small embellishment inside a pocket, simply machine stitch around it. This will allow the embellishment to float and also adds a nice splash of color to the pocket. If you don’t have a sewing machine you could stitch by hand. I couldn’t resist adding a large transparent “E” to my page for both “Eyeglasses” and “Elijah” – my son’s name. There are many ways to go about cutting out a large letter from your background paper. Here’s what I did. 1. Print a large “E” to fit your page. Tip: To save on ink, print your letter in a light gray rather than black. 2. Trim the letter from the printer paper and adhere to your page in the position you’d like the cut-out to be. 3. 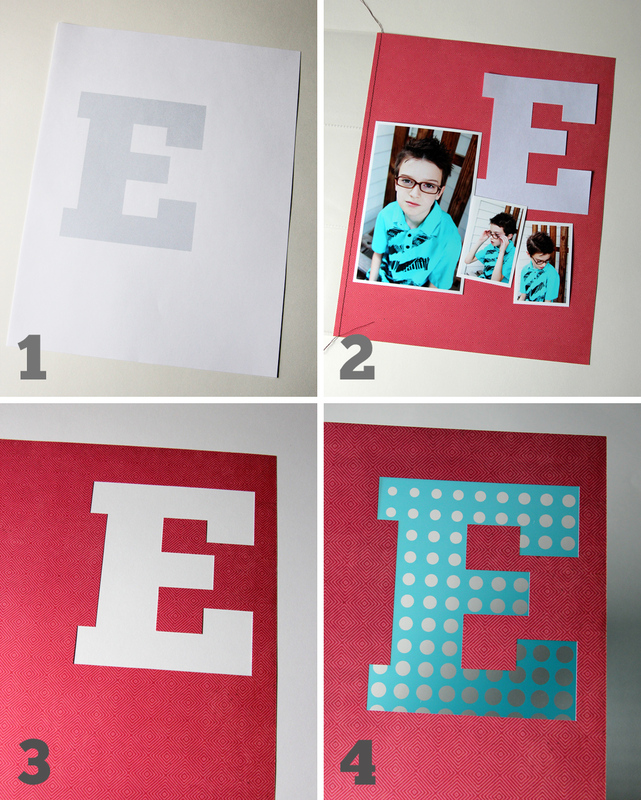 Using a craft knife, cut the letter from your background paper using the printed letter as a guide. 4. Adhere a printed transparency behind the letter opening. Finally, I added my own lenses to a fun eyeglasses sticker. 1. Add two strips of Japanese washi tape to a clear transparency scrap. 2. 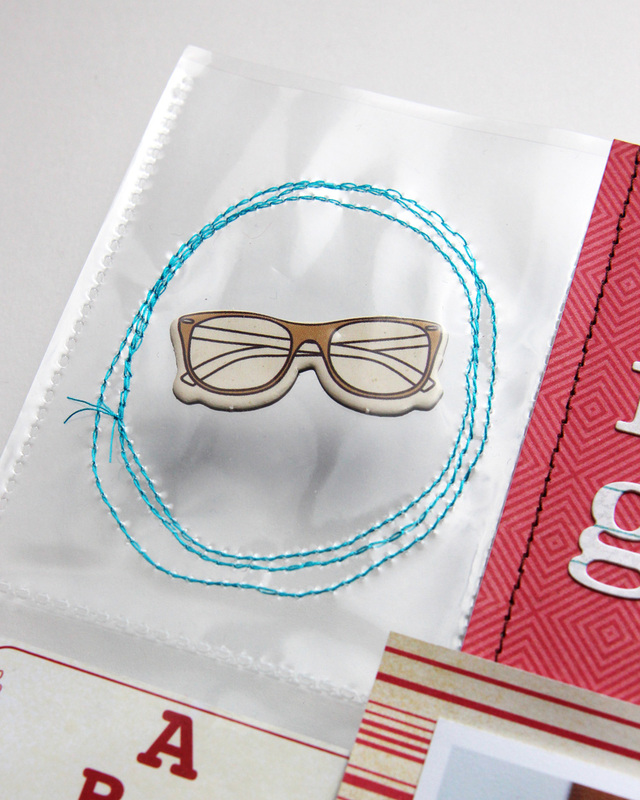 Trace eyeglass lens shapes onto the transparency, cut them out, and add them to the eyeglasses sticker. 3. 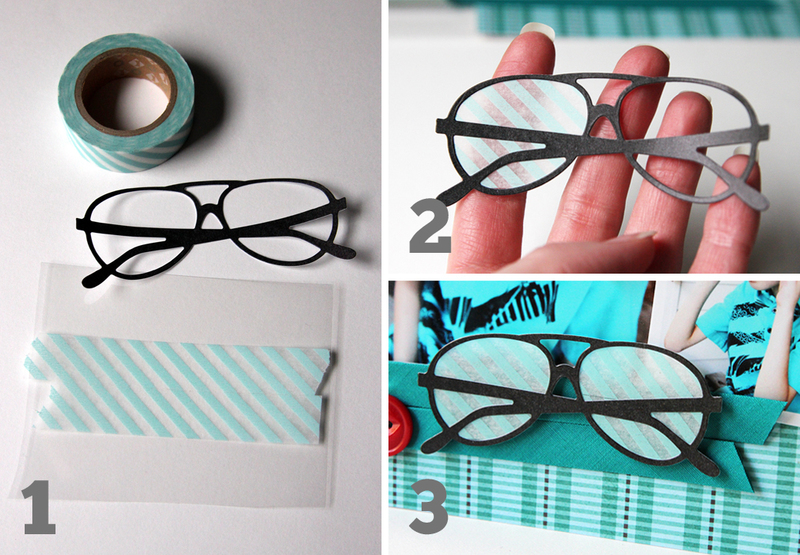 The washi tape isn’t transparent, but adds a fun translucent effect to the lenses – kind of like frosted glass. You may be wondering how to include a page like this – with all the transparent parts – into your album. Place it alone in a page protector to maximize the transparent effect – or, if you’d prefer to have another layout backing it in the same page protector, simply add a piece of coordinating cardstock between the two. Thanks for checking out my project and thanks Katie for having me as your guest today!